3 YRS Xiamen Twandy Food Co., Ltd.
7 YRS Shantou Yixin Foods & Drinks Co., Ltd.
3 YRS Nantong Litai Jianlong Food Co., Ltd.
1 YRS Chaozhou Chaoan District Yongye Foods Co., Ltd.
2 YRS Chaozhou Burton Foodstuff Co., Ltd.
7 YRS Shantou Yangyu Foodstuff Co., Ltd.
Payment Terms: L/C,T/T,Western Union 4.Port: Shantou 5 . Main Markets: Eastern Asia, Mid East, Africa, Southeast Asia, South America 7 . 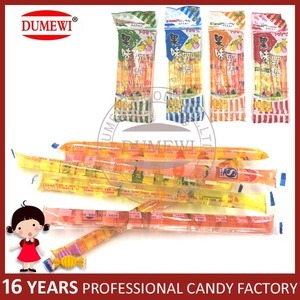 Main Products: Candy, Powder Candy, Chewing Gum, Toys Candy, Biscuit 8.Factory or trading company9 We are a trading company established for over 20 years. 9 . 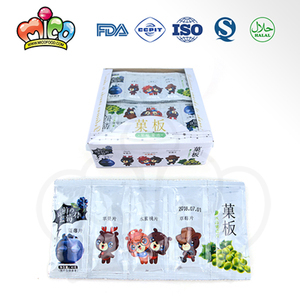 2 YRS Yiwu Hepin Food Co., Ltd.
7 YRS Chaozhou Chaoan Dumewi Foods Co., Ltd.
4 YRS Chaozhou Chaoan Choyo Food Co., Ltd.
4 YRS Chaozhou Zhuangkang Food Co., Ltd.
tray or mesh bag packing 80g popping boba jelly balls/crystal jelly fruit balls Product Poster Name: tray or mesh bag packing 80g popping boba jelly balls/crystal jelly fruit balls Packing: 80g*22pcs*12trays or according your demand Packing Size: 58*41*26.5cm or according your demand Gross weight: 24.3kg/CTN Assorted Flavors: Strawberry, apple, grape, pineapple, mango,peach etc. Design According to your requirement Delivery 25-30 days after order confirmed and deposit received Payment Term: 30%T/T deposit, rest 70% Paid before loading Service: ODM and OEM services are available Shipment port Shantou Port , China Contact information: Chaozhou Zhuangkang Food Co.,Ltd. The pictures Factory Information workshop Warehouse container loading Back to home Send your inquiry Send your inquiry to me ,Click&rdquo;Send&rdquo;Now! 6 YRS Guangdong Wingoo Anime Foods Corporation Ltd.
16 YRS Xiamen Jinhua Hezuo Foods Co., Ltd.
3. Offering the drinks pictures / photos and renew the menus for free within fixed time. 7. Cooperating with customers to build up factories in their country. 3. Supplying stable raw materials and inspect them to guarantee the quality. Ximean Twandy invite you to enjoy delicious together. Only focus on high quality Food! and we only focus on high quality foodstuff. 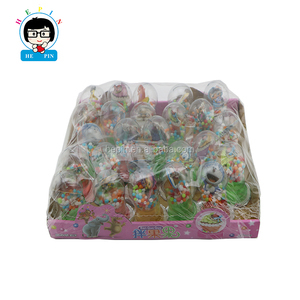 Animal shaped jelly balls jelly fruit balls crystal jelly balls Product Poster Name: Animal shaped bottle packing agar jelly balls/jelly fruit balls/crystal jelly balls Packing: 16g*60pcs*6jars or according your demand Packing Size: 44.5*27*27cm or according your demand Gross weight: 10.7kg/CTN Assorted Flavors: Strawberry, apple, grape, pineapple, mango,peach etc. Design According to your requirement Delivery 25-30 days after order confirmed and deposit received Payment Term: 30%T/T deposit, rest 70% Paid before loading Service: ODM and OEM services are available Shipment port Shantou/Guangzhou/Shenzhen Port , China Contact information: Chaozhou Zhuangkang Food Co.,Ltd. Picture Show Factory Information workshop Warehouse container loading Back to home Send your inquiry Send your inquiry to me ,Click&rdquo;Send&rdquo;Now! 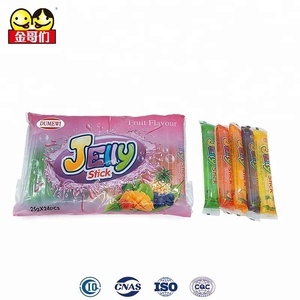 13g Fruity Sugar Crystal Soft Sweet Jelly Stick Item No. 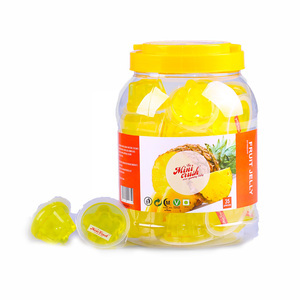 MW-P-58 13g Fruity Sugar Crystal Soft Sweet Jelly Stick Storage Keep in a cool and dry place Packing detail bag pack MOQ 500 cartons Delivery time About 25-30 days after received the deposit and packing design confirmed by buyer Payment Term By T/T , 30% as deposit when place an order Addition Service 1. Shipping service 2. Customize design: Yes WELCOME OEM FOR ALL PRODUCTS! 2. We will control the quality, and offer free samples for test before shipment. 4. We can make the packages as you request, and send you photos before shipment. 4. We will make a complete Loading Report for our customers of each shipment. 6 YRS Zibo Ouchang Gelatin Sales Co., Ltd.
How to identify industrial gelatin, edible gelatin: We can through the following three ways to carry out the initial identification. Edible gelatin is transparent, white, very clean, and industrial gelatin impurities. 4. How about the validity of the products9 According to the products you ordered. 3 YRS Hangzhou Yeastar Biotech Co., Ltd.
11 YRS Lianyungang Dongtai Food Ingredients Co., Ltd.
9 YRS Guangxi Gaotong Food Technology Co., Ltd.
) is located in the industrial zone of lianyungang economic and technological development zone. In 1998, the company entered the food additive industry and has a group of professional teams that have been striving for nearly two decades in the food additive industry. The company covers an area of more than 150 mu and the construction area is over 50,000 square meters. 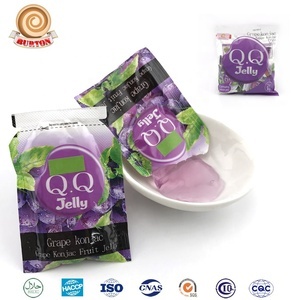 Alibaba.com offers 287 jelly crystals food products. About 8% of these are food additives, 5% are stabilizers, and 5% are sweeteners. A wide variety of jelly crystals food options are available to you, such as haccp, brc, and qs. You can also choose from acidity regulators, flavoring agents, and nutrition enhancers. As well as from vacuum pack, drum, and bag. And whether jelly crystals food is plastic, pvc, or silicone. There are 287 jelly crystals food suppliers, mainly located in Asia. The top supplying country is China (Mainland), which supply 100% of jelly crystals food respectively. Jelly crystals food products are most popular in Domestic Market, North America, and South America. You can ensure product safety by selecting from certified suppliers, including 107 with HACCP, 92 with ISO9001, and 84 with Other certification.